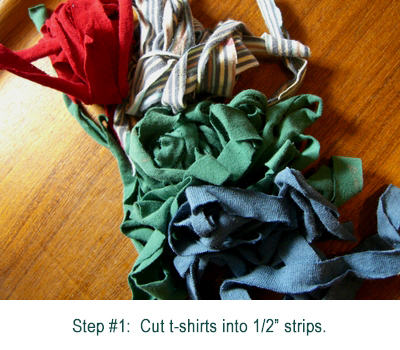 Earth Day is April 22, so help your kids celebrate with an upcycled weaving project using old t-shirts. My six-year-old was fascinated to watch me cut up clothing (not for the first time) and we thought of many more uses for these cast-off shirts. I’m certain that you have some old t-shirts lying around the house, but if you get them at the thrift store, look for extra large shirts with no seams on the sides to make the longest strips. 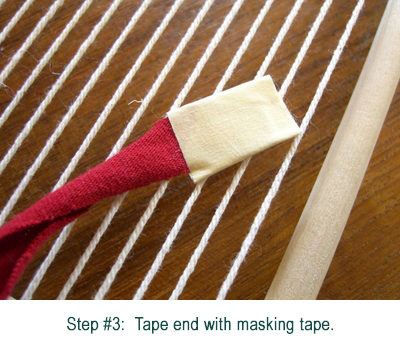 We used string for the base (called warp strings) because I found it easier for little hands to work with, but you could also use more t-shirt strips, creating a denser weave and a fully recycled project. 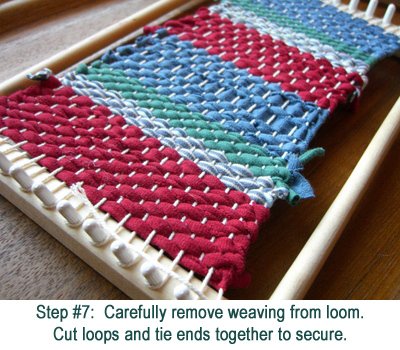 And if you don’t have a loom, don’t go buy one — you can use a cardboard box by following the instructions here. You can make all kinds of things with your weaving. I sewed this one into a little pillow filled with rice and essential oils to be warmed in the microwave for soothing tired eyes. I’m thinking this will make a nice Mother’s Day gift. 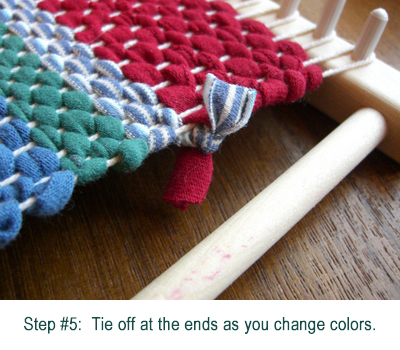 You can turn your weaving into a dollhouse rug, wall hanging, hot pad, or any number of things. 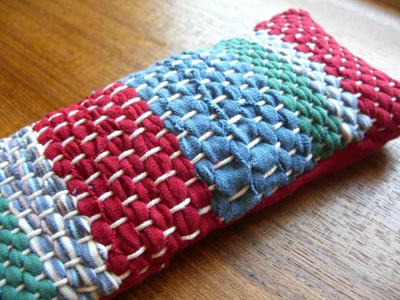 With a little sewing, you can make a fragrant sachet or a pouch to hold eyeglasses, cell phone or camera. All done! 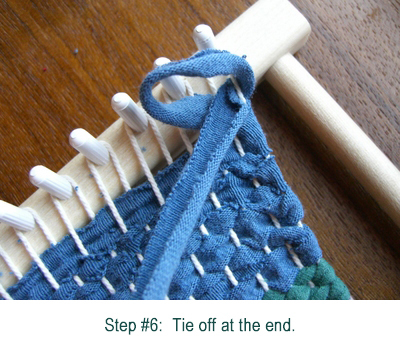 You can tuck in the knots on the sides to make your weaving look neater, but since we were sewing ours, we didn’t bother with this step. I’m going to make some of these on my own to use as dishcloths. What a great idea! Love the pillow. I love this project! And your photos are a perfect accompaniment. THanks for the inspiration. We may try this in our Future Craft Collective classes next week. 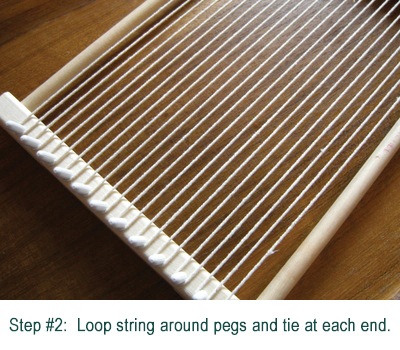 Love the idea of using t-shirts for weaving. Reminds me of my red pot holder loom from childhood, ah.. memories. That pillow is definitely fabulous – neat idea! What a lovely idea. I’m doing a redo-a-tee booth at an Earth Day Fair and this fits right in! By the way, I’ve posted an Earth Day Challenge on my blog, so if anyone is interested in joining, come on over and post your plans for celebrating Earth Day with your family! I have a toddler, but all ages are welcome! I want to touch that pillow thing. What a Grand Idea! I always say Recoup, Recycle, Reuse. Reminds me of my summer camp days. What a wonderful idea for kids to do .love this idea making the pillows. amazing! i think i will make a laptop case out of this! OOOOOOO If I make it a little bigger this will make great, durable rugs for the dogs at the local animal shelter! THANK YOU! Awesome recycling project. This will even hide the yucky stains that most t-shirts seem to acquire. Thanks! what a great idea!! I love all these earth day crafts!! I have been highlighting ones I have done at my blog this week and it’s been really fun!! I will have to add this to my projects to try! Such a cool and unique idea. Great tutorial and pictures as well. Thanks so much for sharing! What a fun idea. Love it! 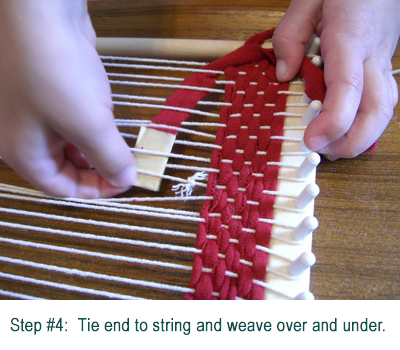 I love your ideas and would like to make this weaving project with my 6 year old grand daughter. However, I don’t want to print out the entire page with all the contents. Can you just have a place where you click on print and we just get the instructions? very good idea and very nice tutorial! just stumbled upon this blog today– so happy i found it! I can’t wait to try this!! I knew there was a good reason I’ve been hoarding all those old t-shirts! Such a great idea! I used to make giant whole-class weavings on a big loom in my art classroom with all of the second grade classes every year. We would turn them into giant rag rugs. I think my daughters would really enjoy this and I love the dish towel idea! I love this! I taught a group of 5 year olds how to weave recently but as I’m totally new to weaving myself, I struggled to make it imaginative. Thanks for the inspiration! I was curious, did you hand stitch or machine stitch to make it into a pillow? What type of material did you use for the back? I’m trying to get an idea because I had my 3rd/4th graders do a cereal box loom and weave T-shirts strips and now we’re ready to finish them. I saw your post and thought that it would be great to have something somewhat useful instead of just having a silly little potholder or “tapestry” hanging.